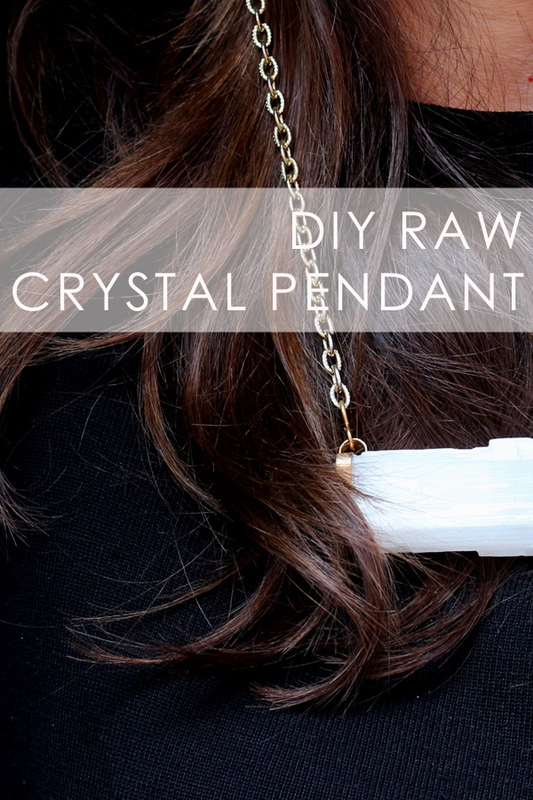 Make a modern minimalist crystal pendant for only a few bucks and using a limited skill set. 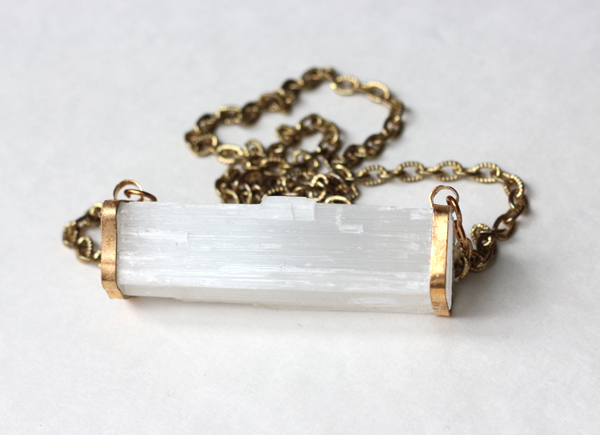 I made this pendant using a big inexpensive selenite crystal I picked up in New Zealand. 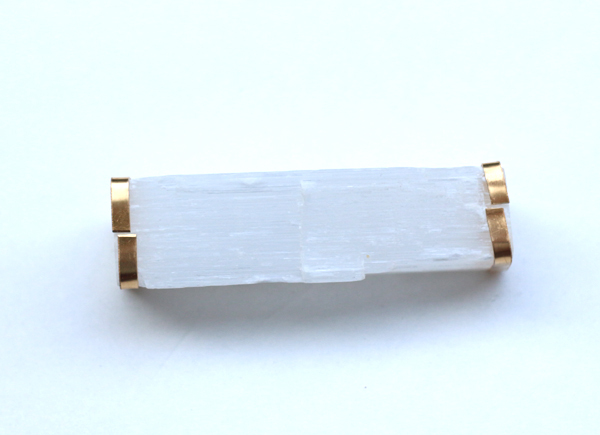 You can use any similar crystal such as quartz. 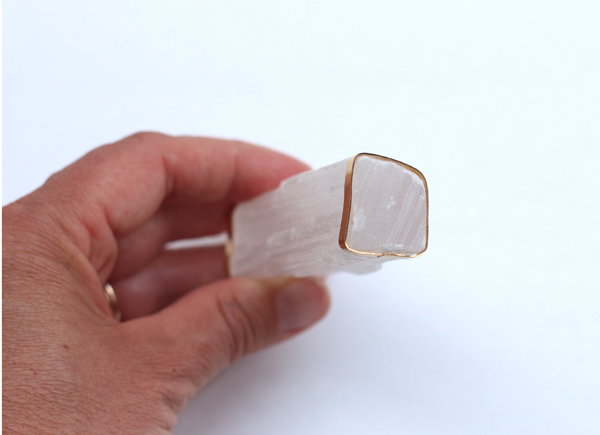 Check out Amazon, Etsy or a museum or science shop for crystals. As far as size goes, mine was a little less than three inches long and a little less than an inch wide. To be different, I made a bar pendant rather than the typical vertical crystal pendant. 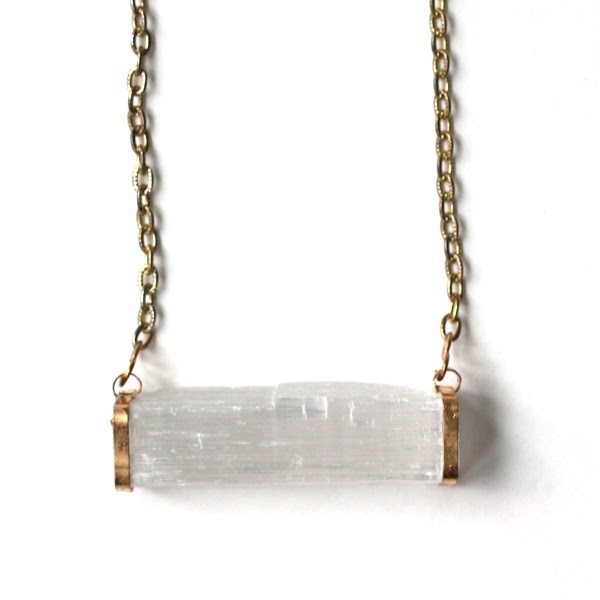 This style of necklace works best with a crystal that is flat on each end but for more ideas for other shapes see my post Raw stone and crystal jewelry inspiration. I wanted a wrapped brass look without wielding a propane torch, and I looked for a long time before discovering bezel wire. Bezel wire is flexible, not too hard to cut and looks good. Your first step will be to determine which side of your crystal you want to face out. 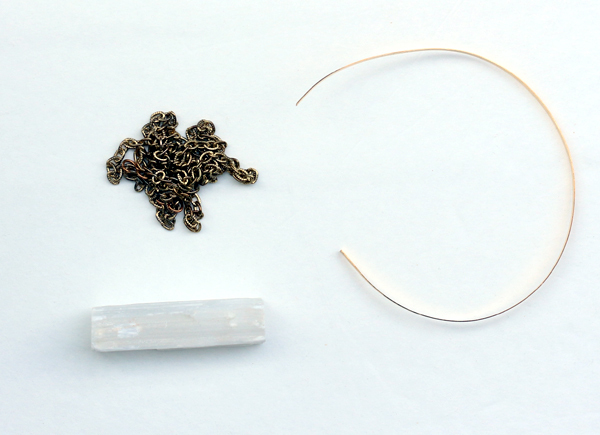 Then cut and bend two pieces of bezel wire to closely fit over the ends of your crystal. This will take a bit of bending and trimming. 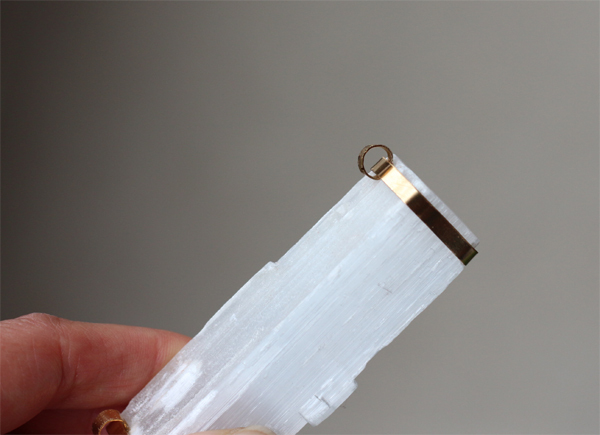 The cut ends should meet at the top of your crystal, as shown below. 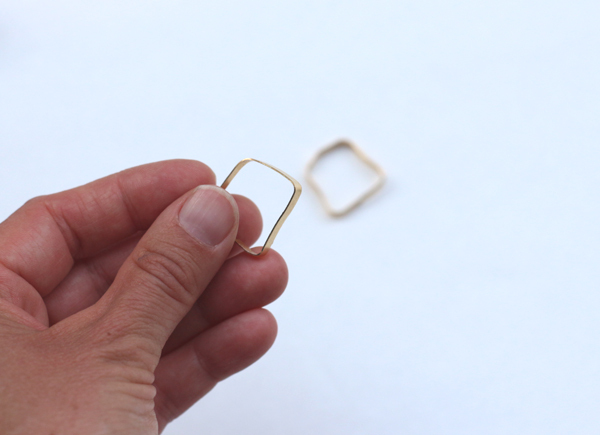 Use round bending pliers to make two jump rings out of bezel wire. The rings should be flat on the bottom so they can slide under the wrapped wire as shown below. The jump rings will also hide the cut line where the ends of the bezel wire meet. 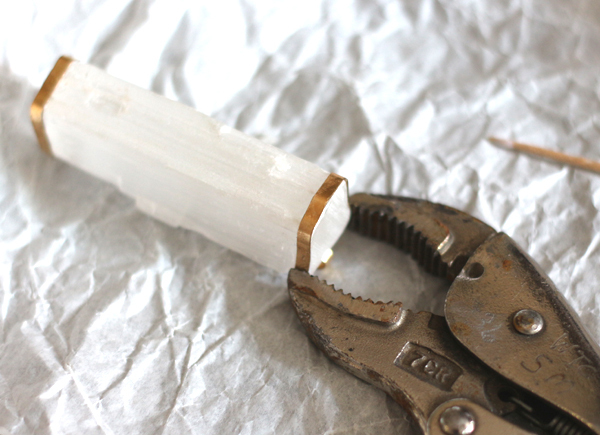 Then apply glue to the inside of the wire with a toothpick and clamp your wire flat to the crystal using a vice grip. A binder clip or clothespin may also work. Wipe off any excess glue. Allow glue to dry and then glue and clamp the next section. Wear your high-end looking crystal pendant. Very cool necklace! Going to go look at your other jewelry tutorials now. Awesome! 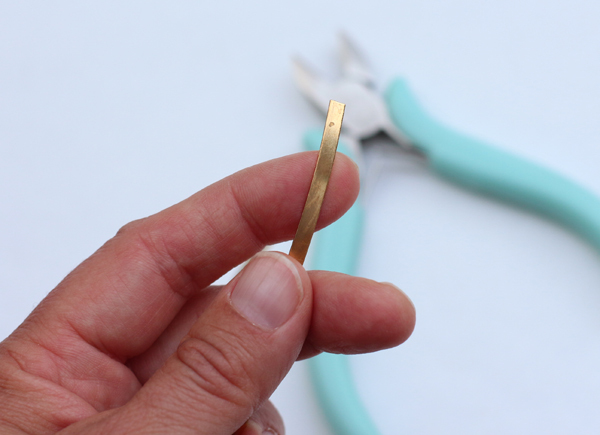 I really great way to get a polished, professional look without the bother of soldering. I love the bezel! Thanks. I'm afraid to attempt anything involving an open flame. wow, nice! I'm going to have to try that one of these days. this looks so minimal and beautiful! I love how delicate it is. You are so talented. I watched and read, but I don't think I have your skills to make this. Love it! I've seen your DIYs. You could totally do this. I thought I commented, but looks like I only imagined it. Great project-- I love the use of bezel wire. I've been thinking about getting some and you're helping push me to actually do it. Bezel wire is the bomb. Thanks much. That means a lot coming from the queen of DIY. Thank you, its real pretty and real easy to do. 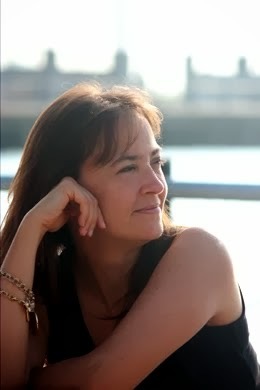 Really cool - thanks for the inspiration! p.s. Your jewelry is gorgeous.